Remember that Elite Vulcan Listing I told you about last month? 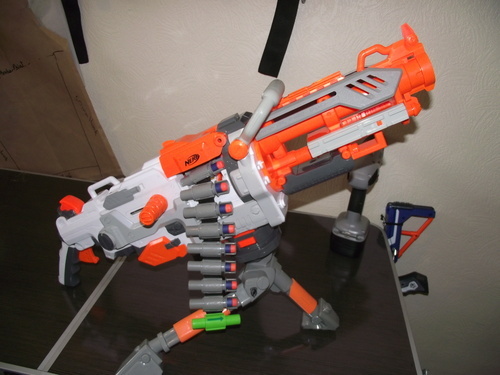 Well UK Blog Diaries of a Nerf Armourer managed to buy one, and it turns out our worst fears are confirmed. It’s merely a recolored Vulcan, featuring the same internals as the old Vulcan. The only changes from Nerf at the moment seem to be modifications to the belt in order to for it to take Elite Darts. Here’s some of their exact words and overview on the blaster. The blaster takes 6 x D-cells as per its yellow predecessor and there are few other changes externally. The belt has only been slightly modified to take Elite darts and is a slightly lighter colour to the old belts that came with the yellow Vulcan. The green cap is here to stay, too, it would seem. External functionality is roughly equivalent, the old bolt action is still there though the rate of fire is supposed to be slightly higher. Our firing videos below will show if that’s true or just confirmation bias on our part. Now to the internals. They’re essentially identical to the old version. We have the same old under-specified switches, the same motor and the same coils. As far as we can tell, there’s no change in the plunger or the plunger volume. It isn’t really worth the extra £20 you pay while the old yellow Vulcans are still around here in the UK. I was really hoping that the Vulcan would get better internals for better ranges, but at least this iconic blaster is making a small comeback. No word yet on whether or not other countries besides the UK will get this in stores. I really hope this makes it to the states; could really use a new Vulcan that isn’t marked up by 25% or so by TRU and transparent green (the green *and* the transparentness screw with any holes I need to drill). The belt is the same as all the later N-strike vulcans, it’s easier to load, other than that, identical to the old belts. Shame it was a Repaint but props to Argos for commissioning it. It is also an eye watering 54 GBP or 88 USD! It’s only a little bit more than the Sonic Vulcan is/was… Stupid TRU and their crapping up price points. BEING CLEAR GREEN DOES NOT WARRANT NEARLY DOUBLE THE PRICE. If it does come to the USA, it should be cheaper then that. Conversation rates a lot of the times make things look more costly then they actually are. Got some white rough cuts popping up on eBay too. Over here they’ve been in Targets for a few weeks now. Pingback: Bester Belt Blaster ? I NEED THIS NOW! !When this is coming out?I see one in Ebay but is too expensive now! It’s already out in the UK, you have to be more specific when you ask “when is it coming out” since we don’t know what country your in. 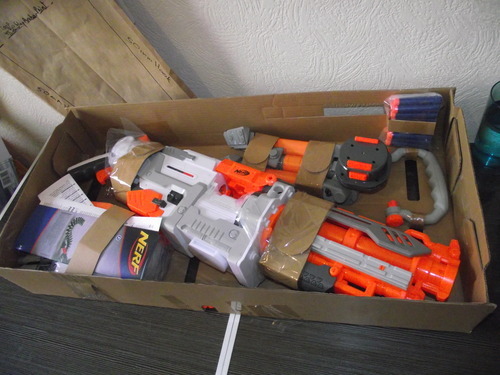 Whew, that’s a lot of money for a Nerf blaster. Even if it being a Red/Crimson Strike one, I’m not sure it’s worth that much in my opinion. Whatever the case, I hope you’ve been enjoying it and I hope it was worth it.